With a standard SOP for installing the Advantech QT package, you can easily integrate the QT development application into your embedded OS and BSP. Advantech also provides guidance with sample code and example Apps. All this helps reduce porting efforts and speed up your product's time-to-market. By offering Advantech QT package and corresponding source code you can easily integrate all the necessary functions and features into your applications. Advantech provides a series of QT modules with source code. 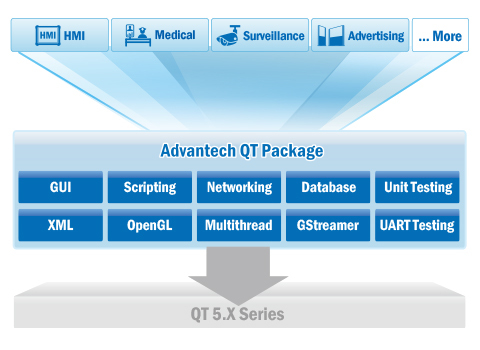 Advantech provides the following QT APPs with source code.